The Hicksville Initiative began in the fall of 2013. Since that time staff, students, parents and community members have taken a great interest in this program. There are three goals focused on for the Hicksville Initiative. One is to improve the culture and climate of our building by creating the most positive environment possible. Two, we expect total student engagement. It is expected students will participate in daily lessons within the classroom. Participating in an extra-curricular event is an added bonus. 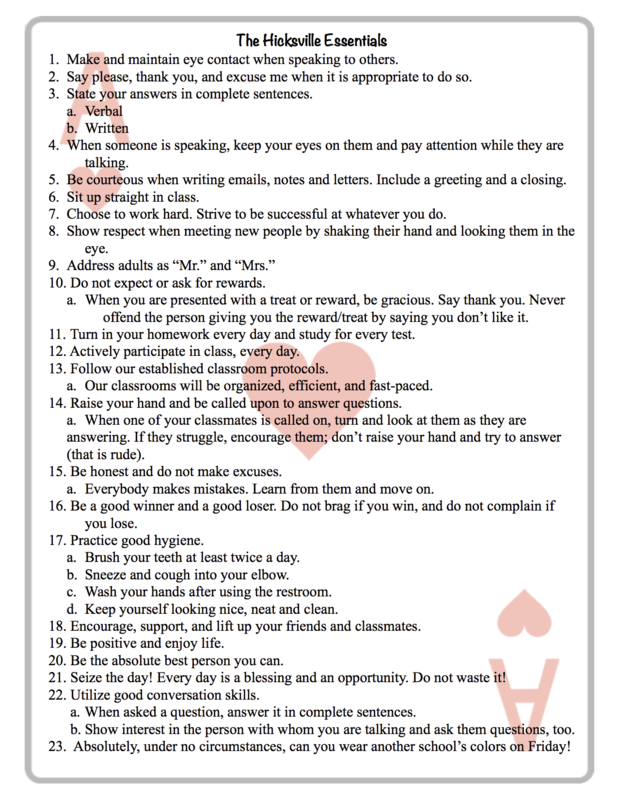 Third, we have very high academic and behavioral expectations for all students and employees at Hicksville Schools. The Hicksville Essentials were implemented school wide in 2014. These twenty-three essentials are reviewed often through announcements, newsletters, and student assemblies. We expect students and staff to model, practice and live by these essentials as we see them as an integral part of the daily life at Hicksville Schools. The Hicksville Shake competition began in 2013. Students in sixth grade practice social/professional skills all year long in the classroom. These skills include shaking hands properly, maintaining eye contact when speaking with others and effective conversational skills. We believe mastering these skills will separate our students from others when applying for colleges or employment. In 1873, Hicksville schools was a four room schoolhouse. We had students from multiple grades learning together in one of those four rooms. Those four rooms were referred to as the Four Houses. The staff at Hicksville Schools believe reinstating concepts from the 1873 style will strengthen our students and employees as one family. In the fall of 2014 we placed every student and employee in one of four houses called Amitié, Coragem, Esemplare, or Setia. Classroom instruction is still implemented in the traditional way, however, activities and assemblies are often held K-12 with the focus of one family, the ACES. Students will remain in their house until graduation and should always represent Hicksville positively and support each other. The “Four Houses” will allow all students to work together across grade levels and grow as a united Hicksville family. The staff often implements House competitions to reward the students who represent their House and Hicksville to the best of their ability. It is our belief as was our founding members of Hicksville Schools that the Four Houses will help set apart our community and school from every other school in the surrounding area. We are always researching ways to continually improve Hicksville Schools and truly appreciate the community support shown with this initiative. We realize that some of this may seem different to what people are use to, but we are dedicated to preparing our graduates to pursue any path they may dream of, and we think this is the way to help accomplish that goal. We believe that together the school and community can work together to take a school and community that is already a special place to another level. Amitié – is the house of friendship. It has the Heart shape which represents love. The house color is red. The Amitié house is full of love, energy, power and determination. Coragem – is the house of courage. It has the Club shape representing education and intellect. The house color is black. The Coragem house is full of power, sophistication, and elegance. Esemplare – is the house of excellence. It has the Spade shape representing wisdom and acceptance. The house color is gray. The Esemplare house is full of security, reliability, intelligence, dignity and practicality. Setia – is the house of loyalty. It has the Diamond shape representing values, security, and responsibility. The house color is white. The Setia house is full of humility, simplicity, peace and perfection. The A in Amitié, the C in Coragem, the E in Esemplare, and the S in Setia spells ACES, which represents one house, one family. Go ACES!